By Kori ~ April 23rd, 2012. Owner/winemaker Charlie Hoppes founded Fidelitas in 2000. Located in Benton City, Washington, in the Red Mountain AVA, Fidelitas gets its name from Charlieâ€™s father-in-law, Dan Fidelis Oâ€™Neill. While working for Boeing in the early 1980â€™s, Charlie was bitten by the wine bug and began experimenting with home winemaking kits. Encouraged by his wife Terri and friends in the wine industry, he decided to pursue his passion and graduated with a degree in Viticulture and Enology from UC Davis in 1988. In the 1990â€™s, he honed his craft at Chateau Ste. Michelle, first as Assistant Winemaker and then as Head Red Winemaker. When he started his own winery in 2000, he decided to focus on Bordeaux-styled wines. 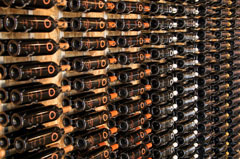 Fidelitas produces about 7,000 cases per year, and Charlie also continues to consult for a number of other Washington wineries. Recently, we had the opportunity to taste a number of Fidelitas wines in a blind samples tasting. While we thought all five of these red wines were good and would recommend all of them, we especially enjoyed the 2009 Columbia Valley Cabernet Sauvignon and the 2009 Columbia Valley Merlot. If you are in the Benton City area, you should definitely visit Fidelitasâ€™ Red Mountain tasting room, which opened in 2007. It has a contemporary style and features great views of Red Mountain and the Yakima Valley. For those of you in the Seattle area, be sure to check out the Fidelitas tasting bar at Urban Enoteca. And even if you arenâ€™t able to visit one of their locations, be sure to try some of their wines. 2009 Fidelitas Columbia Valley Cabernet Sauvignon (Columbia Valley, Washington): 100% Cabernet Sauvignon. Dark purplish red. Aromatic with black licorice, blackcurrant, and black cherry on the nose. More black cherry, blackcurrant, and licorice as well as pencil shavings come through on the palate. Full-bodied with crisp acidity, and high, supple tannins. Well-balanced with good complexity and a long, lingering finish. 2009 Fidelitas Columbia Valley Merlot (Columbia Valley, Washington): 100% Merlot. Deep, dark purple. Nice nose with vanilla, plum, and black cherry aromas. More black cherry, plum, vanilla, and spice come through on the palate. Medium to full-bodied with lively acidity, and medium to high, drying tannins. Well-balanced with a long, smooth finish. 2009 Fidelitas Malbec (Columbia Valley, Washington): 100% Malbec. Deep purple. Aromatic with cherry, plum, and leather on the nose and palate. Medium to full-bodied with lively acidity, medium tannins, and a long finish. 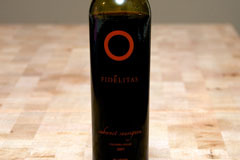 2008 Fidelitas Optu Red Wine (Columbia Valley, Washington): 61% Cabernet Sauvignon, 22% Merlot, 11% Cabernet Franc, and 6% Malbec. Deep, dark purplish red. Nice nose with red fruit aromas and flavors as well as a hint of pickle. Medium to full-bodied with lively acidity, medium tannins, and a medium to long finish. 2009 Fidelitas Red Mountain Merlot (Red Mountain, Washington): 100% Merlot. Deep purplish red. Aromatic with jammy red and black fruits on the nose. Plum and pencil shavings come through on the palate. Medium to full-bodied with lively acidity, medium to high, drying tannins, and a medium to long finish. Fidelitas will be closing their tasting room at Urban Enoteca on April 29, 2012. Thanks for sharing that info. I had not heard. Cheers!